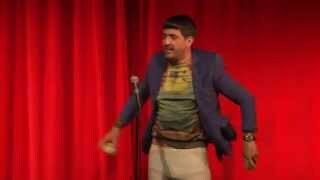 Prop comic Spencer Jones was nominated for the lastminute.com Edinburgh Comedy Award in 2017, the same year BBC One piloted his sitcom Mister Winner. Sometimes performing under the alter-ego The Herbert, Jones was also a runner-up in the NATY new act competition in 2015. He has also had a recurring role in Ben Elton's Shakespearean sitcom, Upstart Crow. We do not currently hold contact details for Spencer Jones's agent. If you are a comic or agent wanting your details to appear on Chortle, click here.